Akro Construction Corp. is committed to building homes which provide sustainable living conditions in a world of increasing environmental problems, accelerating energy costs, diminishing natural resources, and the potential instant loss of energy sources due to natural disasters or accidents. Akro homes exceed the “Oregon High Performance Homes” construction specifications as stipulated by the Oregon Department of Energy. The company name “AKRO” is derived from the Greek language meaning “high”, “superior”, or “standing out.” Accordingly, “Akro Construction Corp.” strives to build “superior” homes guided by the knowledge that energy efficient quality homes offer the least expensive, healthy and comfortable home ownership in the long run. Suncrest is located adjacent to 30-acre Martin Luther King Jr. Park, previously Walnut City Park in NW Corvallis. This prestigious housing area is not only close to shopping and schools, but also to open natural areas. Hummingbird Meadows is located in N.W. Corvallis about 2 miles from Oregon State University Campus and less than a quarter of a mile from Hoover Elementary School. City Bus stops nearby. Other points of interest nearby include Winco Food, Starbucks, Blockbuster, and 30-acre Martin Luther King Jr. Park, previously Walnut City Park. Feather Glen is a treed subdivsion located in N.W. Corvallis about 2 miles from Oregon State University Campus and less than a quarter of a mile from Hoover Elementary School. City Bus stops nearby. Brooklane Solar Village is a planned unit development of 23 lots for single family detached homes around a village plaza adjacent to Mary’s River Nature Park with common landscape maintenance. Located within 2 miles south of the Corvallis City Center, Oregon State University, and the Corvallis Country Club. 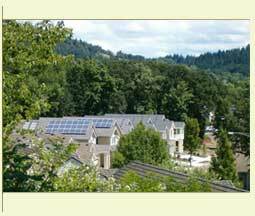 The Brooklane Solar Village strives to be a community of exemplary zero-net energy green homes.